Southeast Asia may be a huge region — but it’s super easy to get around. It’s well-traveled (backpackers have been following “the banana pancake trail” since the late ’60s), and there’s an extensive network designed to ensure that you can easily get from A to B. In Hanoi and need to get to Bangkok? In Vientiane and want to go Malaysia? Or Ko Samui? No problem. Someone can arrange that. But what’s the best way to get around Southeast Asia on a budget? How can you go from point A to point B in the most efficient and easiest manner? Here’s how you can travel around Southeast Asia on the cheap, with example prices and estimated travel times. 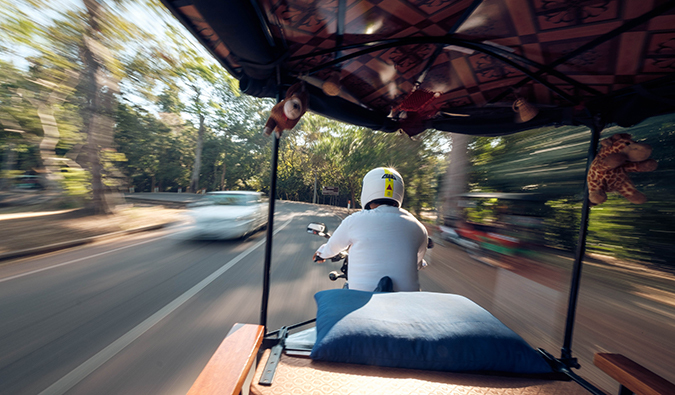 This is the quickest but most expensive way to get around Southeast Asia. There are a lot of budget airlines (like Ryanair or EasyJet in Europe) in the region: Scoot (merged with Tigerair), Jetstar, and AirAsia are the biggest. Nok Air has a lot of flights within Thailand, and VietJet Air is popular in Vietnam. Lion Air serves Indonesia, but its safety record is really spotty and I would not fly them. 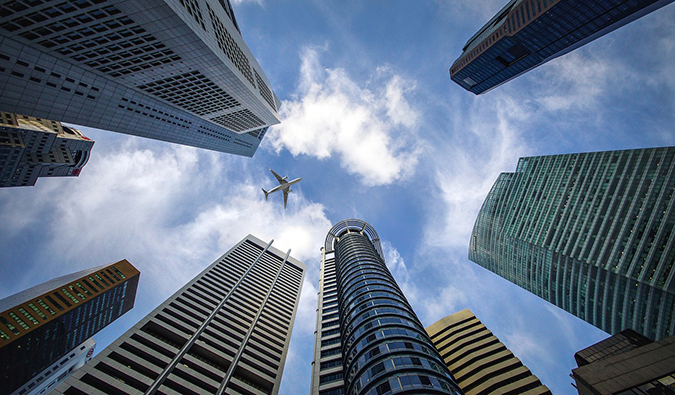 If you book early, you can save on fares, as most of the airlines offer deeply discounted fare sales all the time, especially Air Asia. The best places to find cheap flights are Momondo and Skyscanner. First, budget airlines all fly from smaller, more out-of-the-way airports, so be prepared to take buses or taxis there (and plan for traffic). Second, all these airlines make their money by charging fees for everything, so expect baggage fees, credit card “convenience” fees, check-in fees, fees on fees, etc., etc.! If the fees add up, it can often be cheaper to fly one of the larger, more traditional air carriers, especially when you consider the main airport might be more centrally located. All in all, I only recommend flying if you are pressed for time or find a super cheap deal. 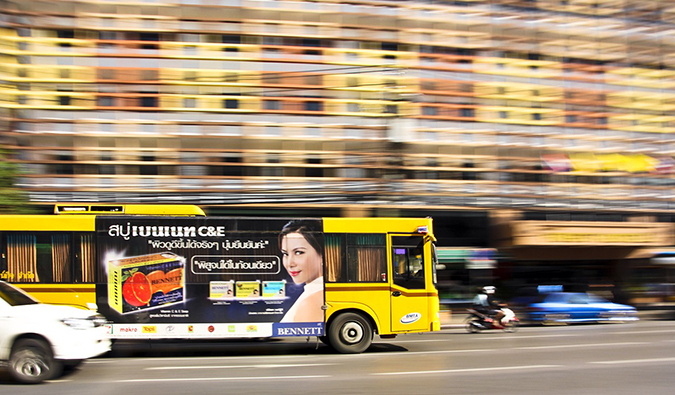 The easiest and cheapest way to travel around Southeast Asia is by bus. Buses will take you anywhere you want to go, no matter how far. Buses are generally run by a plethora of small operators (there is no version of Greyhound here). You simply go with the operator that services the route you want to travel or with the company the tourist agency or guesthouse set you up with. In Southeast Asia, you don’t have to plan ahead that much either. You simply show up at the bus station and buy your ticket! They use a first-come, first-serve basis but are rarely full. You don’t need to book them in advance or online — although, if I know where I’m going, I often book my bus the day before simply as a precaution. In all my years traveling this region, I’ve never shown up and been turned away. Moreover, the backpacker trail in Southeast Asia is so well established that there is a very well-oiled “tourist bus” system here. (Usually, when you book buses from tourist agencies or guesthouses, they put you on these tourist buses.) These buses will pick you up at your accommodation or have a set meetup point in the tourist area and take you directly to your next destination. For example, if you need to go from Bangkok to Chiang Mai, you’d buy a ticket, meet the bus (probably on Khao San Road), and enjoy the night ride up to Chiang Mai with other travelers. No stops at other bus stations — just a straight shot to Chiang Mai. And while tourist buses are very convenient, they are also usually about 25% more expensive than the buses locals use. They generally cost $5-8 USD for a 5-6-hour journey; overnight buses are $22 USD or more depending on distance. There are two organized backpacker specific bus companies that serve Asia: Bamba Experience and Stray Asia. These are hop-on-hop-off buses that travel set routes across the continent. Bamba Experience’s flexible passes start at around $600 USD for 15 days. 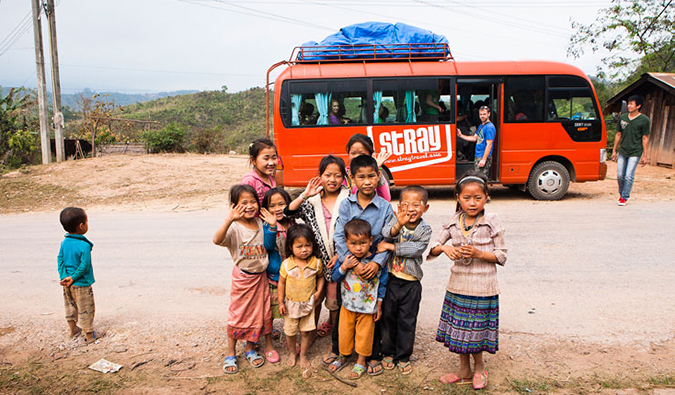 Stray Asia’s pass is about $1,836 for a minimum of 40 days. Personally, I’m not a huge fan of these services. You’re paying for flexibility, but it’s easy to get around the region as well as meet people, so I would skip this method of travel. Even if you’re a first-time traveler, the tourist buses can do everything these tours can do for you. Train service in Southeast Asia is basically nonexistent other than in Thailand, the only country that has an extensive train system around the country (and onward to Singapore), and Vietnam, which has a train along the coast, though it is slow and expensive compared to the bus (1,445,445 VND/$62 USD from Hanoi to Ho Chi Minh City instead of 695,865 VND/$30 USD). Train prices are determined by distance and class, so the farther you go, the more you pay. Night trains with sleeper cars are more expensive than day trains: the night train to Chiang Mai from Bangkok takes 12 hours and costs 965 THB ($29 USD) for a sleeper seat, but that same train during the day is 230 THB ($7 USD). You can travel by train between Singapore, Johor Bahru, Kuala Lumpur, Penang, and Bangkok as well. It’s a long journey that will take you over a day to get there, but you can find fares for as little as $80 USD. If you’re a train enthusiast, it’s one of the most classic rides out there. If you have the time, I highly recommend the experience. Myanmar has train service but it’s very limited. There is no website for Myanmar Railways, but the ministry of rail transportation has a schedule (don’t depend on this though — you’re better off finding out exact times at a station). You can also use 12go.asia to look up routes and buy tickets. 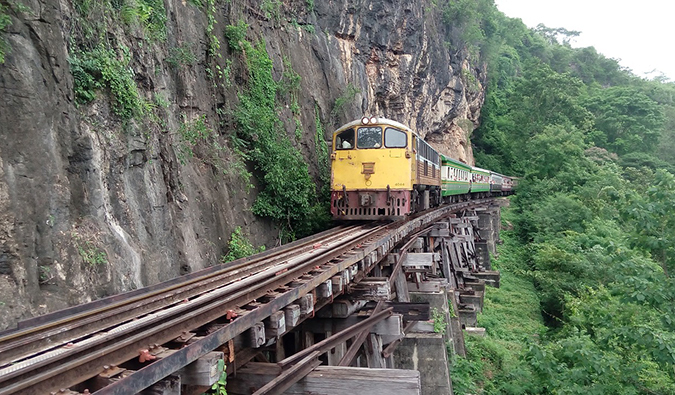 There are trains every day between Yangon and Mandalay, with stops in Bago, Taungoo, Naypyitaw, and Thazi. This entire 15-hour route costs about 4,600 K ($3 USD) for an ordinary seat and 12,750 K ($8 USD) for sleeper class. There are a handful of other routes as well, like Yangon to Inglee Lake via Thazi. In Indonesia, the main cities of Java (Jakarta, Bandung, Surabaya, Probolinggo (for Mount Bromo), and Banyuwangi (the ferry terminal for Bali)) are well linked by train, including. Economy class to Jakarta to Surabaya takes 15 hours and costs about 104,000 IDR ($7 USD), while a 9-hour executive-class trip can cost up to 1,250,000 IDR ($90 USD). Surabaya to Probolinggo (for Mount Bromo) takes 2-3 hours and costs 29,000 IDR ($2 USD) for economy or 150,000 IDR ($11 USD) for executive class. Surabaya to Banyuwangi (for Bali) takes 6-7 hours and costs as little as 56,000 IDR ($4 USD) for economy or 190,000 IDR ($13.50 USD) for executive class. You can reserve your tickets at tiket.com. I don’t recommend renting a car. Rental cars are expensive and the roads here are nuts. I would never drive around the region. However, a lot of people motorbike around the area. I don’t know much about this, but Travelfish does. He’s the guru on this. Check it out here. While this won’t be your main way of getting around, it will definitely come into play in certain countries. 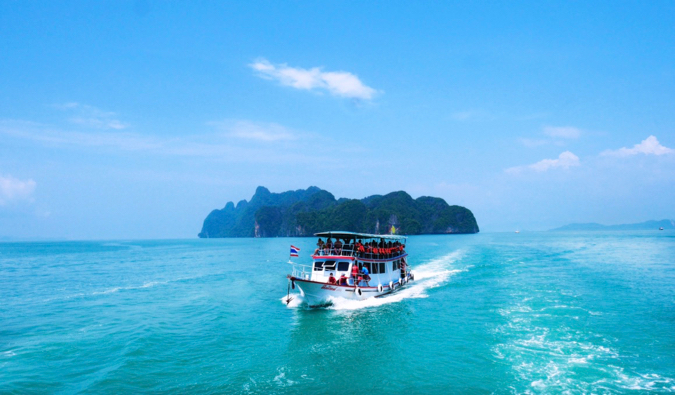 If you’re exploring the islands of Thailand, for example, you’ll need to rely on boats and ferries. And if you’re backpacking around Indonesia or the Philippines, ferries will be the cheapest way to island-hop (but definitely not the fastest!). It’s worth noting that ferries in Southeast Asia don’t often adhere to Western safety standards and lack of life jackets is an issue. Some people recommend staying on the top deck so it’s easier to quickly leave the boat if necessary. While it’s not necessary to book in advance, it’s a good idea during peak season or on more popular routes to book your tickets the day before you plan to travel to make sure you have a spot. You can buy tickets on the ferry company’s website or via a ticket agent like 12go.asia. However, every agent or hostel or hotel can get you a ferry ticket too. It’s really simple! You might also consider doing a multiday cruise on popular waterways like the Mekong River or Halong Bay. On the Mekong River in Laos, slow boats from Huay-Xai will drop you off in Luang Prabang. Slow boats take 2-3 days, stopping at guesthouses for nightly accommodation. Prices will vary depending on the quality of your tour company, but a decent tour will run you around 1,000,000 LAK ($116 USD). Halong Bay tours from Hanoi start around 850,000-1,403,377 VND ($35-60 USD) for two-day trips and increase exponentially from there. Local buses are really your best and cheapest option when you’re traveling in town as well. Fares typically cost less than $1 (and even less if you buy multi-trip passes). All of the towns you’ll visit will have reliable, affordable public bus systems. In some of the bigger cities (Singapore, Bangkok, Kuala Lumpur), you’ll even find subways and tram systems. Jakarta and Hanoi are working on building their subway systems, but buses are still the best option in those places for now. 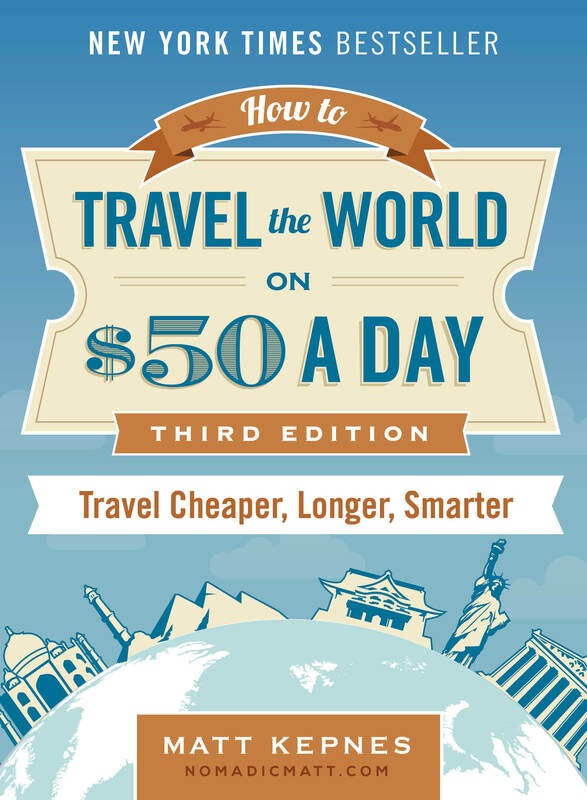 I normally advise budget travelers to skip taxis because they are way too expensive. But in Southeast Asia, you don’t have to always stick to this rule. Taxis and tuk-tuks (small shared taxis with no meters) are options here. They require a bit of haggling and cost more than public transportation, but they are clearly more convenient when you’re in a jam or not yet accustomed to an area. In Singapore and Indonesia, taxi drivers do put on the meter. In Bangkok, you can get taxi drivers to use the meter, but if you’re hailing one in a tourist area, he might try to avoid using it. In Vietnam, the meter is usually rigged, but if you use a reputable company like Mai Linh, you won’t have any problems. Grab (an Uber offspring) is a household name in Southeast Asia. It, too, is convenient, but it sometimes costs even more than a taxi. Gojek in Indonesia is a similar option. 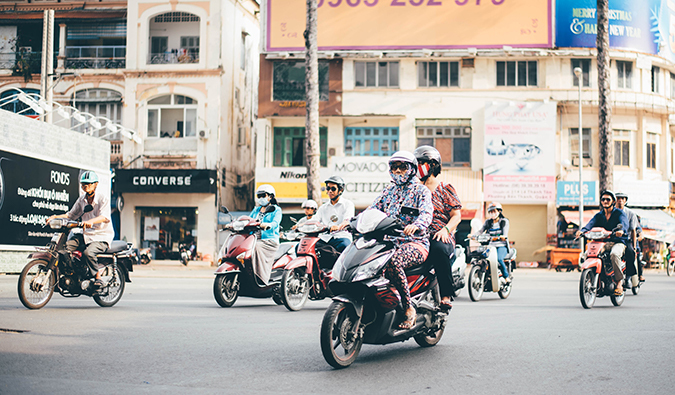 Be forewarned: If you order a Gojek, you will wind up on the back of a motorbike! (Grab will give you the option of car or motorbike so make sure you choose the option that suits your needs best). How Long Does it Take to Get Around Southeast Asia? Here is a distance and travel-time table of how long it takes to get around Southeast Asia. 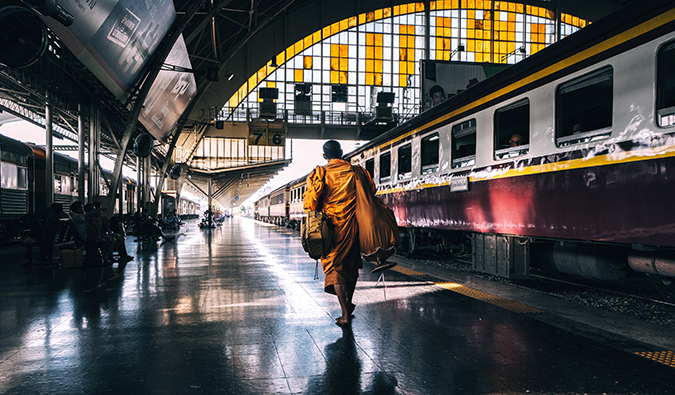 In short, Southeast Asia is pretty easy to get around: take the train as often as you can in Thailand, take the train in Vietnam if you have the time, and take buses everywhere else. If you’re pressed for time, take the night trains or fly. And if you find a good flight deal, definitely fly! As long as you do that you’ll be able to get around Southeast Asia on a budget and make the most efficient use of your time and money! You can book your hostel with Hostelworld as they have the largest inventory. If you want to stay somewher eother than a hotel, use Booking.com, as they consistently return the cheapest rates for guesthouses and cheap hotels. I use them all the time. 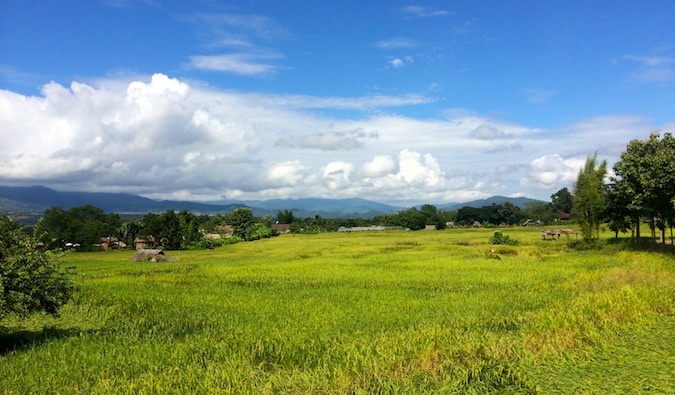 Looking for more information on visiting Southeast Asia? Check out my in-depth destination guide to Southeast Asia with more tips on what to see and do, costs, ways to save, and much, much more! Just to share some insider info on Singapore. I think the best way to move around in Singapore is by MRT (metro). 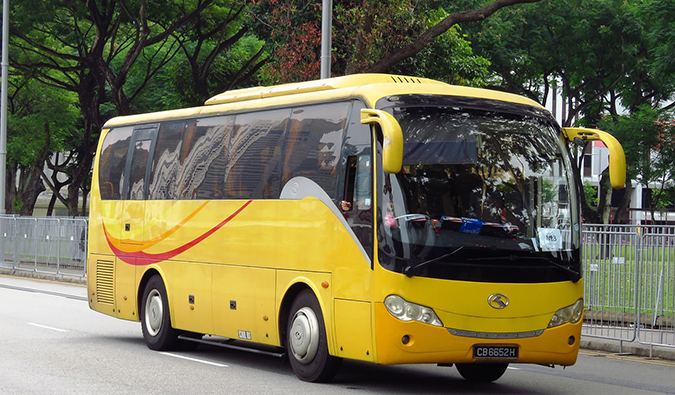 It can connect travelers to major tourist attractions from airport to Orchard and even to Sentosa island. The bus system is also easy to use and is reliable with short waiting time. Just use google map for direction from one place to another, and Google Map will do wonders. Public transport fee is affordable and rarely exceeds S$2 per ride. You can use an Easylink card for all rides on MRT or buses. Singapore also has the official Taxi companies, Grab and Gojek. For the G companies, you can download their app and view the quoted price before confirming your booking. In Singapore, you’ll only get Car (no bike). Great post! We’re in Thailand at the moment and about to go to Laos, Cambodia and Vietnam so this has been really useful for us! Haha, Yeah everything is cheap in Thailand and I guess $1000 is more than enough to plan a 15 days trip to thailand.